The treatment with serum acts mainly in two steps. The first step:- After analyzing the skin to find out the damage, pigmentation and aging of the skin, the physician decides the nature of the serums which will be perfect for the particular skin. After cleansing the skin, the first serum is applied on to the skin in a high pressure, to cleanse and exfoliate the damaged upper layer of epidermis. This serum contains epidermal lysing factors, which will dissolve the upper layer of skin tissues and will make the way for the second phase of rejuvenating serum to penetrate deep. 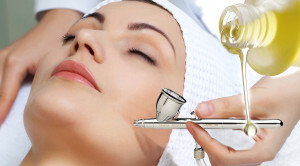 The Second Step:- The Rejuvenating serum is used for the next step of the treatment. It can easily permeate through the next layer of the skin to stimulate the cell growth and activate renewal. The collagen production will be getting enhanced and makes the skin tighten and brighten. The serum is a magical fusion of vitamins, essential amino acids, antioxidants and stem cells, enriched with added growth factors. The unique combination of these constituents are carefully prepared to act as nutrients for mitochondria, as the lack of energy make them to signal for signs of damage and aging . After the completion of serum therapy the skin is patted and cleaned, to make it ready to receive the relaxing effect of a suitable face mask which will help the serum activated cells to get more nutrition and moisture. When the mask is dried and become stiff, the skin is again cleaned and cold wave therapy is given to close the pores on the it. This will be followed by a Galvanic therapy with Fruit Stem Cell Cream, to make the rejuvenation maximum.Best skin lightening treatment leads to full body skin whitening.Siri Care is the best Skin Clinic in Hyderabad.